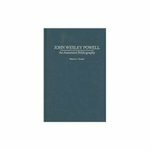 This bibliography provides citations and annotations for the works by and about John Wesley Powell. Thomas, Marcia L., "John Wesley Powell: An Annotated Bibliography" (2004). IWU Authors Bookshelf. 18.